Dennis Connell entered our community, Jupiter Rehabilitation and Healthcare Center on November 6th, 2018, after being at Palm Beach Gardens Medical Center for an acute left superior and inferior pubic rami fractures, acetabulam spurring, and joint space narrowing. Dennis also had undergone a colon resection three months prior and currently undergoes chemotherapy once a week. 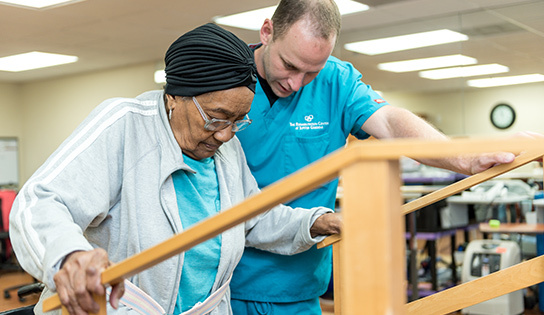 Initially, Dennis required extensive assistance for bed mobility, moderate assistance for functional transfers, and could walk a maximum of 15 feet with moderate assistance. After just only two and a half weeks of rehabilitation, Mr. Connell is now able to return home safely. Today Mr. Connell, is able to get himself dressed independently, walk with a rolling walker independently, as well as ascend and descend more than 15 steps! Mr. Connell is thrilled to be returning home before the upcoming holidays and is beyond excited to spend time with his friends. Mr. Connell shared that he is so thankful for the therapy team for constantly motivating him and for the skills he has acquired. Mr. Connell loves being outdoors; he is looking forward to getting back to his routine of taking long walks, bicycling, sitting by the lake in his community as well as fishing. The team here at Jupiter Rehabilitation and Healthcare Center wished Mr. Connell a safe and happy holiday and to stop by anytime to say hello to his extended family!